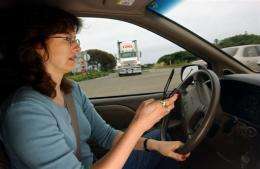 A woman dials a cell phone while driving in California in 2003. The federal agency tasked with keeping US roadways safe suppressed research seven years ago on the dangers of cellphone use while driving, fearing political fallout from the study, The New York Times reported Tuesday. The federal agency tasked with keeping US roadways safe suppressed research seven years ago on the dangers of cellphone use while driving, fearing political fallout from the study, The New York Times reported Tuesday. The National Highway Traffic Safety Administration (NHTSA) opted against making public hundreds of pages of data it had compiled on the dangers of "multitasking" behind the wheel -- particularly texting or talking on a cellphone while driving -- because of concerns about angering members of Congress, the daily wrote. But the data has been obtained by two US consumer groups -- The Center for Auto Safety and Public Citizen -- received after filing Freedom of Information Act requests. They posted some of the information on their websites Tuesday. The NHTSA research, which tracked cell phone use by US drivers in 2002, found that 955 people were killed during 240,000 roadway accidents while speaking or texting on a cellphone. The former head of the agency, Jeffrey Runge, told the Times that he was made to understand that his agency could compile safety data, but not step outside of its established role and lobby states to restrict cell phone use while driving. NHTSA researchers sat on a draft letter they had prepared for the then-Secretary of Transportation, Norm Mineta, informing him of their findings that driving "requires full attention and focus" and that cellphone use behind the wheel "has contributed to an increasing number of crashes, injuries and fatalities." The letter added that hands-free headsets favored by a growing number of jurisdictions only partly resolve the problem, since their studies showed that the main accident risk is caused by the phone conversation itself, when a driver's focus is off the road. "I really wanted to send a letter to governors telling them not to give a pass to hands-free laws," and to educate people about the dangers of distracted driving, Runge told the Times. His superiors at however "said we should not poke a finger in the eye of" members of Congress, the former highway safety director recalled. "We're looking at a problem that could be as bad as drunk driving, and the government has covered it up," said Clarence Ditlow, director of the Center for Auto Safety, as quoted by The Times. The NHTSA research found that at any given time, about six percent of drivers are talking on their cellphones. It's not the whole truth to say that cellphone use while driving is dangerous. It's only dangerous if the driver does not properly compensate (and devide their attention only at proper moments). Safety research ignores this. You can drive while using phone 100% as safe as when not using, but only if you do that usage in a way that fully compensates. This means there are times when u cant use phone at all, and you can never give it your full attention of course. the 'research' is flawed and should not say its dangerous. It should say it is very dangerous if not done properly. btw that photo is great, love the oncoming truck.